The Total Gym XLS is a workout machine from the greater Total Gym brand that is promised to provide consumers with an easy and effective way to workout both upper and lower body muscles.It’s one of our top picks of the best home gym for this year. This product currently can be purchased online for around $730 for a new model; used or refurbished options are also available for reduced prices. Virtually no assembly is required prior to being able to utilize the Total Gym XLS, and the relatively compact construction of this machine allows for it to be used without taking up an entire room. The Total Gym XLS is devoted to providing a low-impact, full muscle workout. This system supports up to 400 pounds and features a pulley and cable system, nylon strap handles, a glide board with head support, and a leg pull accessory. All purchases come complete with an instructional card and suggested workouts in order for users to get the most out of their Total Gym XLS purchases. The Total Gym XLS promises to provide users with a full body workout, and user reviews of this product praise it for being able to do just that. An upgraded version of the basic Total Gym workout system, the XLS model can be used to do an extended workout routine just as easily as it can be used for a short, targeted workout. The inclusion of instructional DVDs with the purchase of this product allows even beginners to be able to enjoy the benefits of this gym. A 1.5-inch thick foam padding provides ample support and comfort, while 6 different levels of resistance help users adjust the difficulty levels of XLS home gym exercises to best fit their personal fitness capabilities. Because the Total Gym XLS can be used for an impressive 80 different workout routines, using the XLS to keep toned should never be a boring prospect. Working out the same muscle groups with different exercise plans can be beneficial for both the muscle groups and user’s mental functioning, as this machine encourages constant creativity with switching up possible workouts. Although the Total Gym XLS is a body-weight dependent exercise machine, the featured resistance inclines can be altered to provide a more difficult (or easier) workout if desired. This way, one machine can actually be perfect for an entire family. The varying resistance and incline levels are also what make this setup a great option for users in physical therapy programs, as it challenges them and enables them to safely regain their strength at the same time. A nutritional program and meal plan suggestions are also included with purchases of this setup in order to help users lead healthy lives overall. 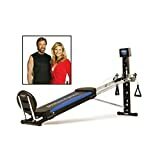 Finally, the Total Gym XLS is actually endorsed by the infamous Chuck Norris himself—reason enough for many consumers to be interested in what this setup has to offer. Although the general frame of this Total Gym is backed by a lifetime warranty, the various parts of the setup are only covered by a mere six month warranty. For the active user, this warranty could easily seem far too limited. Replacement parts are available, but after spending over $700 on the full machine in the first place, having to deal with purchasing parts anytime soon afterwards would be very frustrating. Additionally, although the XLS definitely offers consumers a lot for their money, it still is a fairly expensive unit, particularly when purchased for full price. As far as the actual features of the machine itself go, there are arguably some competitor models that actually offer more workout options than the Total Gym XLS does. Specifically speaking, the Vigorfit home gym features a more supportive and padded squat stand and can be adjusted to offer significantly more levels of resistance than this model can. However, it’s still probably one of the best known brands behind at-home gym systems, and many consumers worried about quality will be interested in purchasing it for this reason alone, regardless of how it compares with some competitor’s features. Overall, the Total Gym XLS system appears to be a quality investment for anyone looking for a compact home gym setup. Although it definitely has some drawbacks, the impressive compact design that allows for easy storage even in relatively small spaces is a huge pro for this product. The fact that it can support up to 400 pounds is also much appreciated, as this strong weight limit should enable most users to feel very safely supported during all of their rigorous exercising. Unlike some other widely- promoted exercise machines that don’t provide users with any instructions on how to do all of the promised exercises, the Total Gym XLS’s package is definitely designed with users in mind; this fact is shown by the inclusion of the informative DVD, as well as the quick-reference exercise chart. At the same time, some consumers might still be more attracted to the Vigorfit at home gym setup. Similar in concept to the Total Gym XLS, this product is currently sold for a much lower price. In addition to its lower price, consumers also might find the Vigorfit’s full machine lifetime warranty to be appealing, as well as its ability to provide users with more resistance level options than the Total Gym XLS features. However, despite these competitor statistics, many consumers will probably still consider this Total Gym to be the ideal workout system for them. This home gym is backed by a well-know company, and frequent discount deals online help to reduce its overall cost significantly. When considering these discount offers, the price of the Total Gym XLS really makes it a great deal.